Today was the first outdoor sketch of the season! It was blue sky, sun and 54 degrees. It is also two for one. First, it's another for my series of Renton public art as it is a newly installed sculpture called "Going Global". The artist is Benson Shaw. 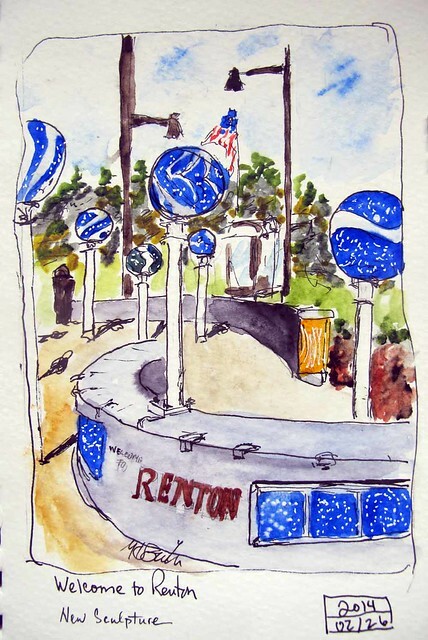 Second, it fits the Urban Sketchers' weekly theme of "signs", as it is a new "Welcome to Renton" sign. I sat in the sun on the sidewalk next to a very busy main street. It was so warm all I needed was my light fleece sweater. Fortunately, I did not have an experience similar to the sculptor's. When he was installing it, an out of control car came "careening over the cub and smashed into a pole"!